This three story miniature living space for a woodland creature or mouse began its life as a large round cardboard cannister. Made from recycled materials, this is an inexpensive display to make and a great way to introduce a younger generation to the fun of making miniature projects from found materials. As shown here, the house easily accommodates the poseable miniature mouse made from felt, as well as standard Calico Critters (Sylvanian Families). It is built roughly to 1:24 scale, which means it will accommodate tiny ball joint dolls like the "Realpuki" elves as well. This set of instructions will cover just the basic structure and exterior finishing. There will be a separate set of instructions for finishing and wiring the interior. Important! - read the full set of instructions before you begin to cut anything. As all container are different sizes, you want to arrange the openings in your container to suit your scene, and the size of your miniature figures. Check the size of your figures against the door sizes on the printable template sheet (pdf file, acrobat reader required to open) to make sure those templates will work for your house. If not, make templates for the doors and windows you want in your house, and cut the openings only after you have read all the instructions. To make the miniature house as shown, you will need a round cardboard sided container which is roughly twice as high as the miniature creature or figure you want to house. I used a large iced tea carton, which has a metal base, cardboard sides, and a plastic lid. Similar containers are used for a range of dry goods, including cocoa. Strong Kraft Paper - mine came from a recycled grocery bag - you can also use parcel wrap, or dark brown gift wrapping sheets (the type which are deep brown with a copper metallic glint work well. Covered Wire - I wrapped flexible wire tightly with strips of kraft paper, commercial paper covered wire is also available. Tissue Paper - this is used to make the 'bracket fungi' for the balcony and shelves. I used recycled lightweight tissue from store wrappings. Fabric - This is used for the hinges for doors and windows. I use bias binding tape but thin ribbon or any dark fabric will work. Lightweight card - again recycled card from packaging or cereal boxes works well. Clear Plastic or Sheet Styrene - for windows. Pencil Crayon or pencil, to draw in mortar lines for the slates and board lines for wood floors. Miniature Acorn Lamp - you can make this with or without wiring for electricity. PVA Glue - I used thick Aleenes Fast Grab Tacky Glue but any pva or woodworking glue will work. Fine Sandpaper - on a small sanding block or scrap of wood. The first step in making your house is to determine where you want the doors and windows to be. I designed my house with a back opening which is roughly 1/3 the size of the circumference, setting the door, kitchen window and balcony in the remaining space. The easiest way to determine how you want to lay out your house, is to wrap the outside of your container with a piece of plain paper, and sketch out your plan, or tape the printable pdf (acrobat reader required) paper templates on the paper to try out some ideas. Once you have decided on a layout for your interior and exterior, cut the ground floor openings for your house, first cut the back opening, cutting it as an arch to help support the lid. (see photo). Before you cut the openings for the doors and windows, make sure you have allowed space for an interior run of stairs (if you want stairs) as well as marked the height of the second floor, so you can set any second floor doors or windows above the height of the floor. I suggest you leave cutting the openings on the second floor until you have the interior floor finished (see next steps). When you are sure you have everything positioned to your liking, use a sharp knife to cut the openings. Cut the openings so the doors and windows are left in one piece, you will use these curved scraps of card for other parts of your house. When you have all the openings cut, use your sandpaper on a scrap of wood or small sanding block to sand the cut edges of the openings. To fit the doors in place on the exterior of the house,and to fit the stairs on the interior you will need to have the finished floor prepared. You can use brown kraft paper dry brushed to mimic the effect of wood grain, then draw floorboard lines with a brown colored pencil. I decided to make a slate floor. To make the floors for your mouse house interior, use a pencil to trace around the exterior of the container on a piece of printer paper or scrap paper to make a template. Cut out the template and fit one inside the house, creasing it up along the edges of the walls of the container, and marking where the flooring needs to go through the door opening. Trim the template to size and shape, and test fit it again. When you have a template that matches your ground floor, and sticks out through the door opening to the container exterior, use the template to cut a piece of lightweight card for your floor. Test that the card fits properly inside the container. To make a faux slate effect, glue rough torn bits of tissue paper to the card (color of tissue doesn't matter. Have some overlap, and leave some small gaps in other areas. Take a paint brush and coat all the tissue paper (while the glue is still damp) with a coating of dark grey or black paint. Some of the tissue paper will bunch up, this is fine. If it bunches up too much flatten it out a bit with the handle of the brush. Leave to dry. When the paint is dry, dry brush on bits of grey to mimic the effects of slate. (I used an old toothbrush to sweep across the black paint blending the grey into the black in streaks. )Leave to dry. When your flooring is dry,use a light grey or white pencil to draw in irregular lines for slates (or square ones for slate tiles). See photo. Press down heavily on the pencil to emboss the card slightly, leaving the effect of grout lines on the floor. Set your floor in place in your house but don't glue it down yet. You will glue it down during the interior finishing phase. Trim it to fit neatly through your door opening. The second floor of the mouse house will be made from heavy chipboard or Bookboard. You will use a template cut the same way you designed the template for the ground floor. Before you cut the second floor, you will need to mark where you want the floor to sit in relation to the rest of the house. To do this, take a strip of paper equal to the interior height of your container. Fold the strip at the height you want the first floor ceiling (above the height of whichever creature you wish to house, and above the height of any door opening you cut). Use this folded strip against the base of the tin to mark a line for the floor height all around the interior of the tin as shown in the photo. Now make a template for the upper floor and cut it from heavy card (or glue layers of lighter weight card together to make a strong floor. Set it in place above your marked line and check your position and outline for cutting your upper story openings. I only cut an opening for French doors on the second floor, and I set that opening so there would be room for a bed and the opening for a staircase away from the French doors. Cut the upper level openings. When I finish the interior of my mouse house I will have a curved set of stairs leading from the ground floor to the upper level. I want to make sure my stairs don't interfere with my door, so I worked out a rough run of the stairs to see how steep they would be before I cut the opening for my door. I wanted my stairs to go from the left side of the main back opening, to just before the door opening. Cut a scrap of squared (graph) paper or draw a simple grid leaving steps roughly 1/4 inch high and 1/4 inch wide (rise and run) to mark out your staircase. Your final step will be onto the level of the floor above. Use this template to position the openings you cut into the walls of your house. The instructions for making the stairs will be in the interior finishing instructions. The stair supports will need to be cut from the curved section of your main container, the piece cut away to open up the back of the container. Make sure you decide on the length and height of your staircase before you cut the door and window parts from the curved back piece of the container so you have material for all of them that matches the curved walls of your container. If you used the printable templates to mark and cut openings for your miniature mouse house the pieces you cut out will be used for the outside of the doors and windows, and you will need to cut similar pieces for the interior doors and windows so you can sandwich plastic 'windows' between the layers. Lay out two copies of your stair risers on the piece you cut for the back opening (see photo) as they are the most difficult pieces to cut and must be cut from a material with a similar curve to the walls of the container. Cut your duplicate doors and windows from the areas which are left. To finish the doors and windows for the mouse house first carefully peel away any coatings from the card that made up the sides of your container. My iced tea container was lined with a metallic plastic lining which needs to be carefully peeled away before paint can be applied. Check that the cut openings for the windows line up on your inside and outside window pieces and trim if necessary. Test fit the window and door pieces into your openings and make sure they are trimmed to go over the card you used for flooring on the main floor. Sand the edges of the windows and the window openings with sandpaper over a bit of wood scrap or a sanding block and paint them to resemble wood or bark, or choose a color to give them a colored paint coat if you prefer. Paint both sides, and try to avoid flattening the curvature of the pieces as you work. The balcony and other shelves on the exterior of the mouse house are designed to resemble the bracket fungi that grow on trees. To make the balcony, take a scrap of medium weight card, or two layers of light card glued together, and cut a D shaped section which fits snugly against the curve of the container below the opening for the French doors as shown. To open the French doors the balcony will need to be wider than the opening. I also made a bracket to fit below the kitchen window beside the door, and another to fit beside the balcony to hold plants. (see finished house photo on page 1). To give the balcony and exterior shelves the effect of bracket fungi on logs, paper mache made from tissue paper is glued to the underside of the cardboard cut for the balcony and shelves. Tissue paper is folded and glued to make a pad, then a layer of glue is applied to the pad and an outer coating of tissue is glued over the base. The back of the shelf is trimmed to match the back curve of the shelf or balcony floor. Set this aside to dry. When the main shape of the fungus is dry, a strip of tissue is twisted into a tight roll and glued to the upper edge of the card, leaving the curved back edge free where the fungi will be glued to the log. (see photo). After drying, the top of the balcony / shelf is dry brushed with a variety of browns and greens, while the rounded underside is given a coat of thick acrylic paint or gesso, and sanded fairly smooth, then repainted a soft off white. The easiest way to hinge unusual shapes is with a fabric hinge. I used sections of bias binding tape cut to the length I needed and glued to the inside surface of the miniature door and window sections. Make sure you keep the fabric free of the window panes. Press the fabric well into a thick layer of glue to make sure the glue penetrates the fabric. When the fabric hinge is dry, you can add a handle to each side of the door (inside and outside) using mini brads if you wish, the tines of the brad will be hidden inside the door. Make paper templates for a single piece of plastic or clear styrene that will make the window "glass" for each door or window, cutting the template so the "glass" overlaps some of the window or door surround. If you wish you can color the plastic windows with markers or gel pens to create stained glass effects in miniature. Cut the window plastic and glue it to the inside of the door, over the fabric hinge. Glue the other side of the door or window into place, matching all edges of the door or window and trimming if necessary. Set aside to dry thoroughly. When the door and windows are painted, assembled and have dried, fit them into the openings on the exterior walls of the mouse house. Sand or trim the openings if necessary. Remember that the openings will be painted as well, so the windows and doors should not fit their openings too snugly. Paint the edges of the openings to match the doors or windows. When the paint on the opening edges has dried, apply a thick layer of glue to the exterior of the house on the hinge side of the window or door. Spread the glue out with a scrap of paper or a glue spreader. Press the hinge firmly into the glue, making sure that the door or window lines up with it's opening correctly. Leave to dry. 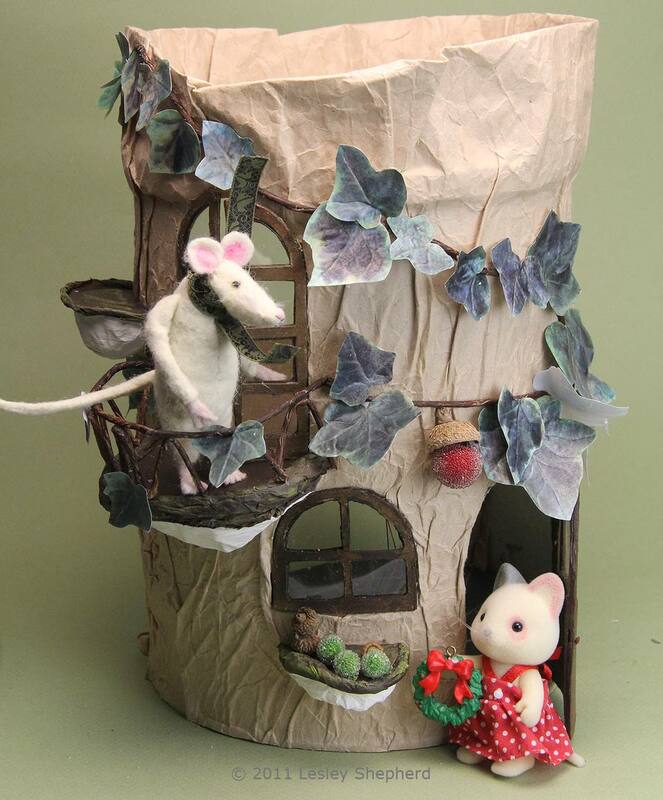 Cover the Exterior of the Mouse House with "Bark"
The bark on the exterior of the mouse house is made from crumpled kraft paper. To create this effect a piece of kraft paper at least 1/3 longer and taller than the exterior circumference of the house is twisted several times into a tight paper rope, uncurled and re-twisted in a slightly different direction. If you prefer, you can use dark brown gift wrap for this process instead. When your paper has enough texture, unroll it. Coat a small section of the exterior of your house from the top to the bottom with a thick layer of glue, beginning at one edge of the back opening. Set your paper so it is roughly 1/2 inch below the base of your container (you will trim it later) and three to four inches above the top of your container. (You will fold this edge over t make a railing for the rooftop patio at the end). If you want to make a top floor patio as I did, put the plastic lid back on your container before you start glueing your "bark" in place. Press your crumpled paper against the glue, rolling it into the glue with your hand. Make sure you leave thick crease in the paper, don't try to smooth it out. Apply glue right up to the edge of the plastic lid, and right up to the edge of each opening as shown, taking care to avoid getting glue on the opening part of the windows and doors. Leave a bit of excess paper near the back opening of the house, trim it, and glue it to the back opening and slightly around the edge towards the inside to finish the back opening. When you have cut the rough opening for the windows and doors of your miniature woodland house, peel the paper back away from the opening and turn it under so the fold matches the opening for the door or window. Press the kraft paper back into the glue securely. The folds allow you to gently stretch the paper in case you make any cuts too close to the opening. Do not glue the paper back inside the window opening, fold it back on itself and glue it so it matches the opening but does not block it. As you clear and finish each opening, check that the window or door opens or closes correctly before you add glue to the next section of the container to cover it with "bark". When you have the exterior covered with paper, use sharp scissors to trim the bottom edge even with the bottom of the container. To finish the rooftop of the miniature mouse house fold the paper at the top over so it makes an edge roughly waist high on the figure that will inhabit your miniature house. Leave roughly an extra 1/4 inch more paper, to insert down into the edge where your plastic lid now sits on the top of the container. Remove the plastic lid carefully, without moving the paper coating on your container. Glue the inside of your folded paper 'railing' together, and fit the cut edge down around the top edge of your container so it catches in the glue on the sides below where the plastic lid was sitting. Fit the plastic lid back in place and leave the upper patio 'railing' to dry. With your 'bark' applied to your complete exterior, you can choose to leave the kraft paper plain, or finish it darker by dry brushing acrylic paint lightly over the surface. Fit the Balcony and Exterior Shelves to the Mouse House. Check that the paint and glue holding your 'bracket fungi' has dried thoroughly and set the main balcony in place on the miniature woodland house below the French doors. Trim if necessary to fit tightly against the exterior wall of the house. Mark the position after testing how the doors open against the balcony. Apply a thick coating of glue and press the bracket to the house matching the lines you marked, holding it until the glue grabs. Set the container on its side so the bracket presses into the wall of the house. Leave to dry. I added another shelf below the lower floor window, and a mid sized shelf halfway up the wall on the side of the French doors closest to the back opening. This keeps the balcony from sticking out on its own. If you measure it correctly, the lower shelf below the window can also serve as a coffee table if your figure is sitting. To finish the house and the balcony, a railing made of vines is glued to the side of the house and the balcony edge. To Make the Vines The vines are made by wrapping wire (roughly 26 gauge) or long twist ties, with a kraft paper coating. narrow strips of paper are wrapped around the wire similar to the way florist's wire is wrapped. You can see the same technique used on the miniature Moses basket to make raffia wrapped wire. When the wire is completely wrapped with paper, it is brushed with a coating of brown acrylic paint to differentiate the bark from the bark on the exterior of the house. Set the painted kraft wrapped wire aside to dry. When the wire is dry, lay out a pattern similar to the growth of a vine, which begins beside the door then runs across to the edge of the balcony. The same wire is used to make the upper railing of the balcony, curving the wire out to match the balcony floor then bringing it back to glue against the exterior wall. When you have the wire shaped, apply glue to the back of the wire a small section at a time, and glue the wire firmly to the house exterior as shown. To Make the Railings To make the balcony railing, a second section of wire is folded up and down, with the bends at the height of the upper railing and the balcony floor. When the section is completely bent, the bends are glued to the upper railing and the front edge of the balcony, gluing one or two bends, holding them until the glue grabs, then gluing another one or two bends. Care must be taken not to push down on the balcony as you are gluing the railing in place. When the railing is finished, another section of vine can be attached to the side of the house, joining the original piece beside the door, but this time running up and over the French doors, finishing at the back edge of the mouse house. Fixing the Outdoor Light - With the vines in place, a miniature drill is used to drill a hole for the wires from the miniature acorn light and the wires are fed through the wall to the inside of the house. The acorn light is then glued in place to the exterior wall. When the glue is dry, the light can be fitted to the acorn cap over the light bulb. With the vines and light securely glued to the house you can add ivy leaves to the vines if you wish. Print off a copy of the Pdf (acrobat reader required) ivy leaves and coat them with a clear gloss coating. When the gloss varnish is dry, shape them with an embossing tool or rounded toothpick run along the veins while the paper is sitting on a foam pad (mouse pad?) or other slightly soft surface. Apply a bit of glue to the top notch of each leaf and glue it to the vine, setting the largest leaves lower on the vine than the smaller leaves. The instructions for the interior of the mouse house are in a separate article. Make a Rustic Miniature Bed From Twigs.